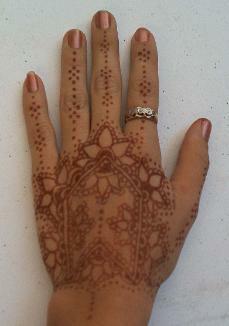 Henna stains your skin so henna tattoo’s are pain-free - no needles! originates in the warm, moist regions of North Africa and Asia. be orange at first and will darken over 48 hours to a brown-red color. 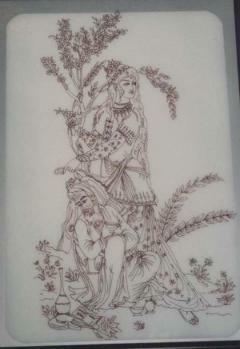 henna depends on many factors including skin type. Therefore with henna there are no guarantees. 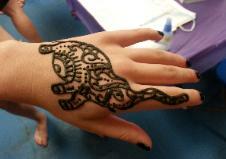 *Avoid scrubbing and rubbing henna when drying- pat off instead. *Avoid lotions, washing dishes and other household chemicals. *Coat with vegetable or mineral oil daily before contact with water. weeks on lower legs and arms. darken to full color. A deposit is required to hold the time slot. ART or to place an order. WARNING!!!!! DANGER!!!!! BLACK HENNA CAN BE FATAL!!! leaves of the henna plant and gives an orange through brown stain. black henna is using an ingredient other than henna to achieve its color. 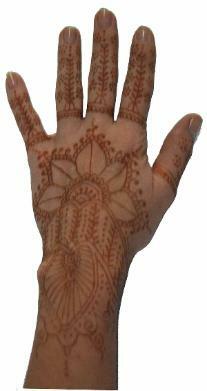 contrast to henna, which only penetrates as far as the dead skin cells of the epidermis. 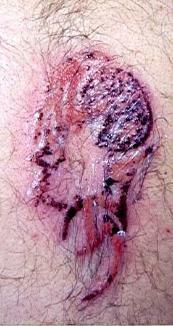 occurred from PPD's use as "PPD Black Henna". 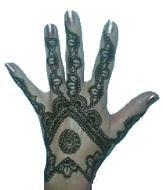 prepare PPD-based black henna are at risk as well.